MARK3 Full Spectrum Cannabidiol (CBD) Oil is a premium, high grade extract taken from the whole hemp plant which contains an array of naturally occurring cannabinoids, as well as essential vitamins, fiber, flavonoids, terpenes and more. Our CBD tincture is derived from organically grown, non-GMO hemp in Oregon. 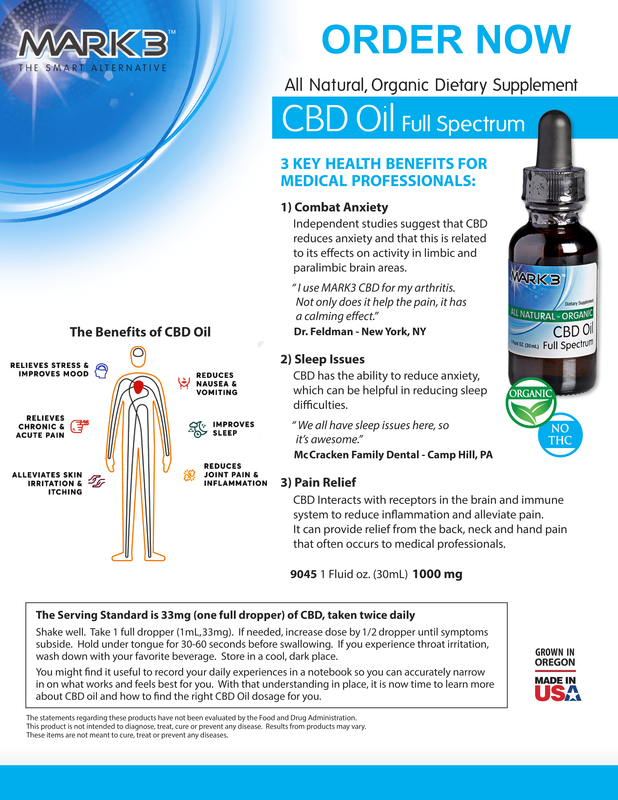 Full Spectrum CBD Oil is well known for its many health benefits, including reduction in inflammation, aiding with sleep issues and combating anxiety. We utilize organic MCT oil as the cannabinoid carrier, which also provides numerous health benefits and is a source of energy boosting fatty acids. MARK3 strives to bring you the best quality CBD Oil on the market which is why each batch is 3rd party lab tested for potency, purity, and for pesticides. Our CBD oil is THC Free and will not give you the high associated with cannabis. MARK3 CBD provides users with the many benefits of THC without the detrimental aspects associated with it. *The statements made regarding MARK3 CBD Oil have not been evaluated by the Food and Drug Administration. This product is not intended to treat, cure, or prevent any disease. Results from products may vary.